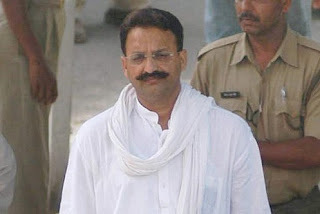 Mukhtar Ansari, his brothers, Sibgatulla and Afzal, and son Abbas joined Bahujan Samaj Party (BSP) on Thursday after Akhilesh Yadav deny seat to Ansari in Uttar Pradesh Polls 2017. Announcing their induction into the party at a press conference, BSP chief Mayawati defended the move saying that the allegations against the jailed leader have been not been proven so far. Ansari is the current MLA from the constituency of Mau Sadar, and Mayawati said that's where the BSP will field him in the upcoming Uttar Pradesh Assembly elections . The BSP supremo announced the merger at a hurriedly-called press conference at her residence. She said it's yet to be established in court that Ansari is a criminal. Ansari, who's currently lodged in jail, has been an accused in the (BJP MLA) Krishnanand Rai murder case. But Mayawati said Mukhtar was a victim of political vendetta and a conspiracy hatched by the Samajwadi Party (SP). Ansari, who merged his party Quami Ekta Dal with Samajwadi Party last October, is currently lodged in Lucknow jail. He is a four-time MLA who first won on a BSP ticket from Mau in 1996. After unsuccessfully contesting the 2009 Lok Sabha elections, Ansari was expelled from the BSP for “criminal activities”. He went on to form Quami Ekta Dal with his brothers in 2010. The recent turf war within the Samajwadi Party took an ugly turn when former state unit president Shivpal Yadav invited Ansari to merge his party with SP Chief Minister Akhilesh Yadav was against the merger and was quite vocal about it. The bitter feud however culminated with Akhilesh ousting his father Mulayam Singh Yadav from the national president post.